1 Place the chopped plums, sugar, ginger, peppercorns and 200ml water in a small saucepan and simmer gently for 15 minutes until thickened and pulpy. 2 Pour the mixture into a fine sieve and press gently to extract the juice. Discard the pulp and allow the juice to cool completely. Stir in the vodka and chill until ready to serve. 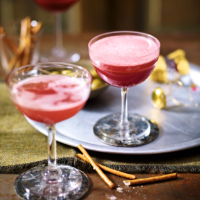 3 Pour the plum vodka mix into 6 Champagne coupes (or flutes) and top up with chilled Prosecco. Serve swiftly. Freeze any leftover juice and vodka mix in an ice cube tray and thaw before using.